I’ve been kinda absent on the internets lately, it’s been partially due to a ridiculous cold/stomach flu I had last week and then the fact that it was my husbands birthday this past Monday! We like to do birthday weeks, but he’s on call for work this week, so it ended up just being a birthday weekend. We spent the entire weekend out and about, it was exhausting and nice at the same time. I’m kinda spending this week catching up on orders and shop stuff. It’s been pretty dreary lately, but I caught about a half hours worth of daylight yesterday for photos. 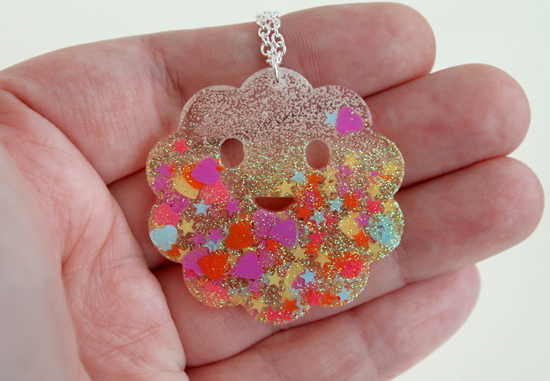 Which meant I was able to add a few Monster Cloud Necklaces to the shop!! Sprinkles, confetti and glitter, oh my! Here’s another little peek at what will be in the shop update tomorrow afternoon!! I was finally able to get around to updating a few more items in the Etsy Shop! Some New Pillows, Trapezoid Necklaces, Little Houses, Hand Cast Plastic Supplies and more! !